The effect of natural resource abundance on economic growth has long been discussed in many studies, and most of them show that resource abundance negatively affects growth. However, most of these studies are conducted at a cross-country level. 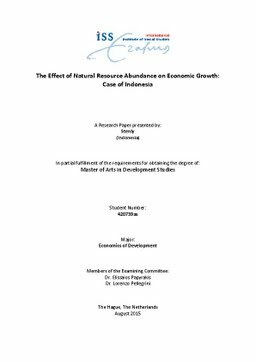 This research paper tries to find out the impact of resource abundance on economic growth at a local level of Indonesia. By employing data at provincial level from 2004 until 2013 and using panel data analysis, this paper finds that in average natural resource abundance has a significant negative impact on economic growth in Indonesia. This paper also discovers that income, inflation, and crime are the possible transmission cannels, where natural resource of mining in Indonesia tends to increase income, but lower inflation and crime.